Processes in Bizagi can send notifications (both automatic and user configured) by using an e-mail server which is SMTP compliant, such as Lotus Notes and Exchange, amongst others. To use this option, you merely need to specify that e-mail server's location (along with other parameters), so that this server is used in your Bizagi project. 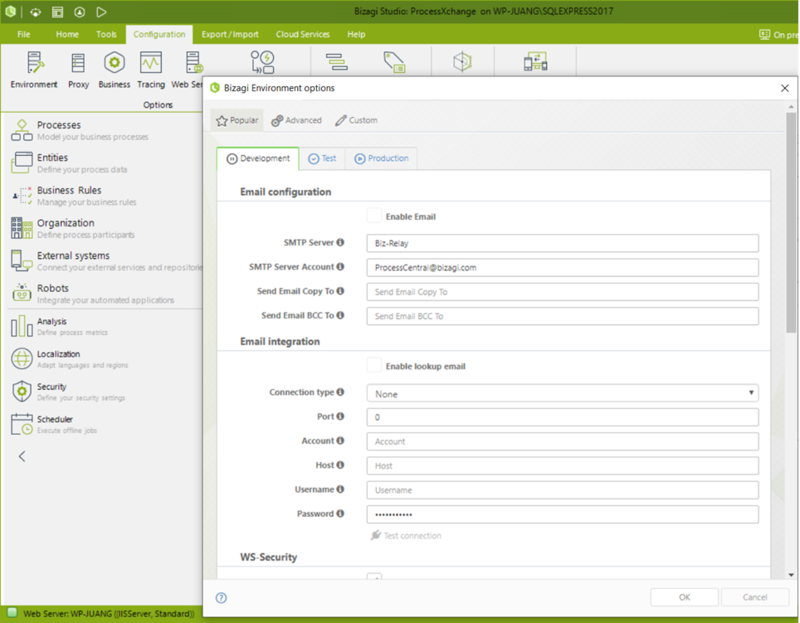 Within this configuration, you may set different SMTP Servers for each of your project's environments (Development, Test or Production). Setting which e-mail server will be used by your Processes is simply done by entering the relevant details in the environment parameters of your Bizagi project. Bizagi supports connecting to an SMTP-compliant e-mail server, being SMTP the widely and commonly used protocol for this purpose. Such details are specifying mainly: the name of your corporate SMTP E-mail server, the sending account and optionally, if you want to send a copy or blind copy to a specific account. Then, enter the details for the SMTP parameters presented in the Popular section, according to the descriptions in the table below. Mark this checkbox if you wish Processes in your project to send notifications (for both automatic and user configured notifications). Enter the name or IP address of your e-mail server. Take into account that this server must be SMTP-compliant. Enter the e-mail account which will be the sender of your Bizagi notifications. Specify an e-mail address to be copied in each of the sent notifications. Specify an e-mail address to be blind-carbon-copied in each of the sent notifications. Notice that in this window's tabs, you may also initially define the SMTP parameters for your Test and Production environments. Parameter values for your Test and Production environments, may also be edited and managed directly at that given environment by using the options presented in Bizagi Management Console. To view more information about the configuration through this option, refer to Environment configuration. Once the E-mail server is specified in the SMTP settings in your Bizagi project, notifications in Processes will be automatically sent through this server. To view more information about the notifications that will be sent by using this setting, refer to Defining notifications. You will also need to make sure that the Bizagi Server where your Bizagi project is running, has allowed access to the specified e-mail server. For instance, you may check with your IT team that requests from Bizagi's Server IP address -through the default SMTP port number 25- are not rejected. In case that you do not wish to use your corporate SMTP server in the development environment, or in case that this SMTP requires authentication, you may configure the use of a local e-mail service within the same Bizagi server.